Levisticum officinale is a hardy perennial herb that's simple to grow from seed – sow a few seeds in a tray or small pot and keep well watered on a sunny windowsill to germinate. Prick out and pot on when each plant is a few inches high. If you don't have a dedicated herb patch, it looks good in a flowerbed, too – 2m tall, lush, bold and shapely – in among the flowers. It also grows on very well in a large, deep pot. Plant out at any frost-free time from late spring to early autumn, and divide large plants in autumn or spring. Keep it clipped (easy, when you realise how useful it is in the kitchen) to encourage fresh new shoots and don't let it dry out – lovage is fairly thirsty.You can toss its lively young leaves in salads or tuck them into the cavity of a chicken or fish before roasting; finely shredded, they are a great addition to soups, stews, mash or scrambled eggs; you can steam the stems, braise the roots and use the seeds in biscuits and bread – what's not to love about lovage? The flavour is like parsley and celery combined with a hint of aniseed and curry. And if you think that sounds intriguing, you'd be right. So why aren't we all using it by the handful, and why is it virtually impossible to buy? 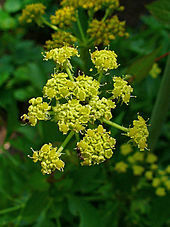 Lovage is native to western Asia and the Mediterranean, and was admired by the ancient Greeks and Romans for its medicinal as well as for its culinary properties – it was believed to cure everything from rheumatism to sore throats and indigestion. Medieval travellers tucked the leaves into their shoes because of their antiseptic and deodorising properties. Charlemagne was so smitten, he ordered it to be grown in all of his gardens. 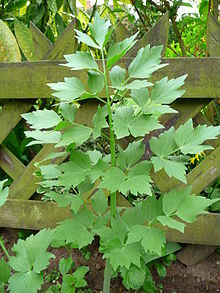 The name 'lovage' is from "love-ache", ache being a medieval name for parsley; this is a corruption of the older French name levesche, from late Latin levisticum, in turn thought to be a corruption of the earlier Latin ligusticum, "of Liguria" (northwest Italy), where the herb was grown extensively. The green leaves, cut into fine ribbons, are very good with lightly cooked summer veg. Or add them, chopped, to salads or stuffings for pork or chicken, or to fish chowder, or to just-boiled new potatoes in a mustardy vinaigrette. Lovage is delicious with eggs, too – stir leaves into omelettes, scrambled egg or frittata. Tender young stems (from the centre of the plant) can be steamed and served as a side vegetable – lovely with a summer roast chicken. You can even peel the large tap roots and use them in stews, or cook them as you would salsify. When the seeds start to turn brown, harvest them and use in place of celery seeds in pickling mixtures, breads or in savoury biscuits to go with cheese. You can even use the hollow stems as a peppery, tongue-tingling stirrer for bloody mary – and if that doesn't make you fall for this most lovely of herbs, I don't know what will. Cook the pasta according to the packet instructions. Meanwhile, heat the oil in a large saucepan over medium-high heat, add the courgettes, season and sauté until slightly golden, about five minutes. Add the garlic and lemon zest, and fry for a minute. Stir in the lovage. Taste and season again. Drain the pasta (reserve some cooking water) and toss with the courgettes, a couple of tablespoons of cooking water, parmesan and ricotta. Serve in warmed bowls with more parmesan sprinkled on top. • Learn new skills on a four-day cookery course at River Cottage; go to rivercottage.net for details.